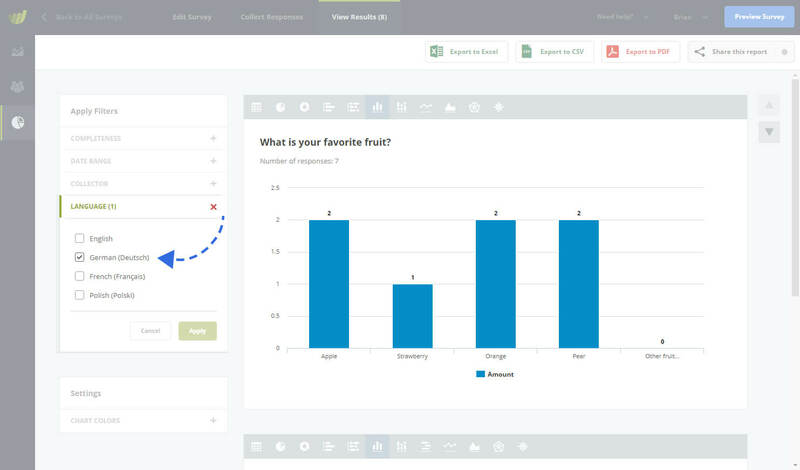 You can create or translate one of your existing surveys into any language. We provide a built-in translation editor which makes the translation of your survey very easy. Providing your survey in the participants first language will not only help with your response rate, but will also give you more accurate and detailed results. Your survey needs to have some content before you can start translating it. We recommenced that you set up all of it’s questions and content first, in whatever language you would like to be your default. Only once you have finalized your survey should you start translating it. 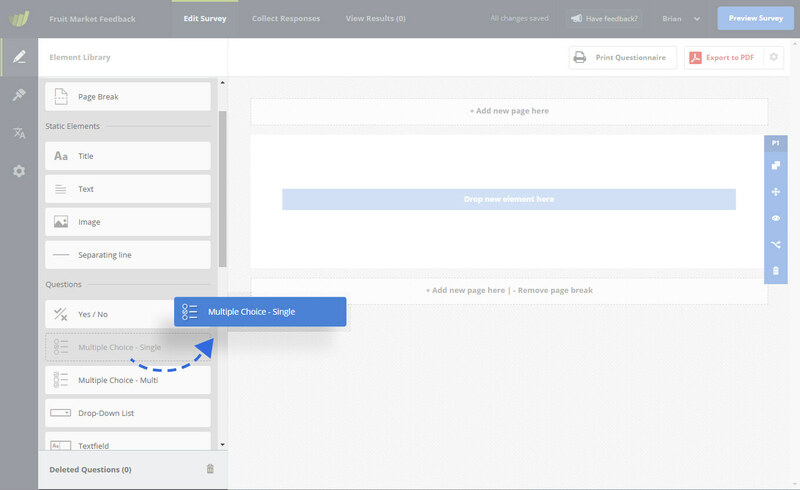 This approach minimized the risk of making changes to your survey and then forgetting to update the translations too. Once you have added the default content to your questionnaire, you are ready to start translating. Go to the Translate Survey section to begin. Since you have no languages setup yet, you will be shown a message that will prompt you to start translating. When you begin this process, you will be asked to define a) what the current language is (the current language should be set to the same language that you have already been writing your questionnaire in) and b) what the first language is that you would like to start translating your questionnaire into. You will only need to do this once. Adding additional languages after this is just a matter of selecting what further language you would like to add. 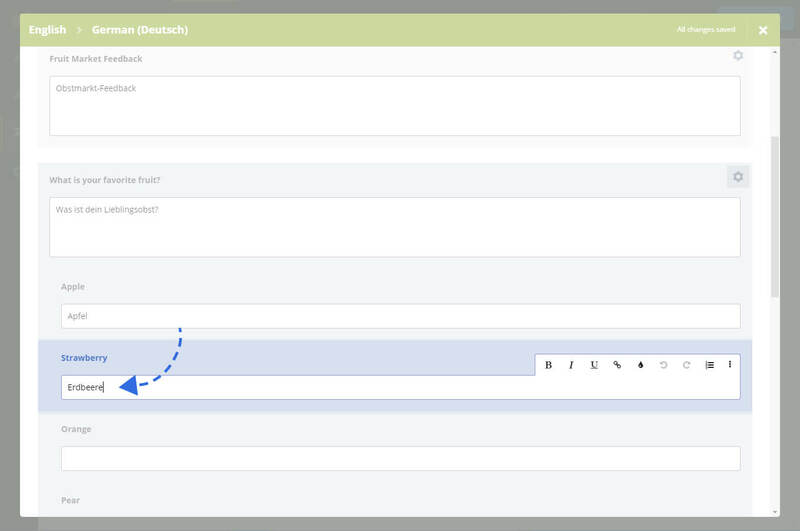 When you add a language, you are immediately shown the Translation Editor in an overlay. It is here where you can enter your translations and add all the texts in the required language. On the left side of the screen, you will see the text from your default language as a reference while translating. Any changes you make will be automatically saved and when you are done, you can simply close the overlay. By default, any language you add will not be active. You will need to manually activate the language yourself by making sure the toggle is switched on. This should only be done when you have completed the translation because all active languages will be shown to participants in the language selection. If your translation is not yet complete, you do not want to show it to participants. By clicking on a language item in the list, a preview of that language will be shown on the right. To edit the translation, you can click on the “Translate” button below the language name. 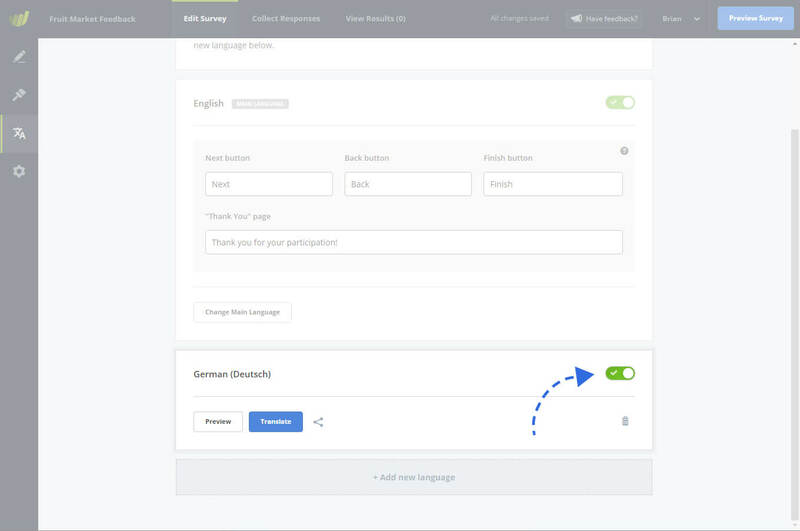 Above the list of languages, you will see a text input that allows you to change the text “Please choose a language:” which is shown on the language selection page to your participants. You can also empty the field if you do not want to show such a message. When you have added all the languages that you require and completed all of your translations, you can then set how you would like to manage your different languages in the collector settings. You can find out more about collectors here: Add Survey Collectors. 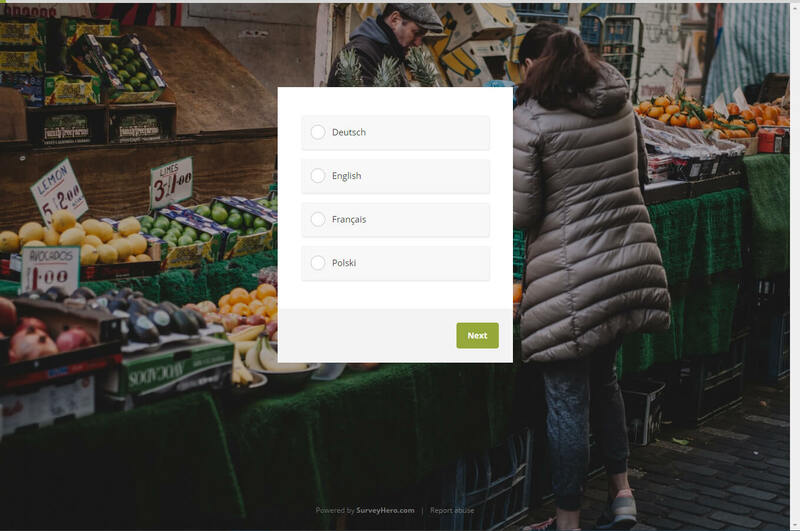 You are ready to share your multilingual survey! Do not provide other languages This is the default option that is selected whenever you create a new collector. 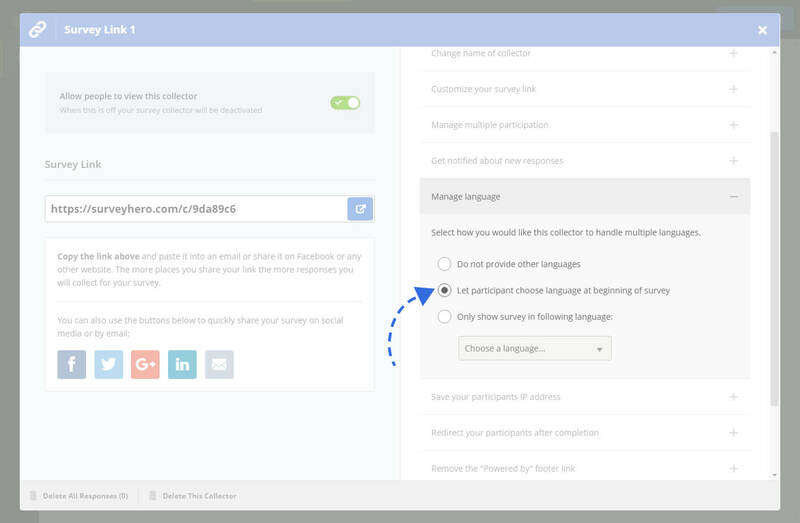 When this option is selected, your participants will not see any language selection and be presented the survey in its default language. 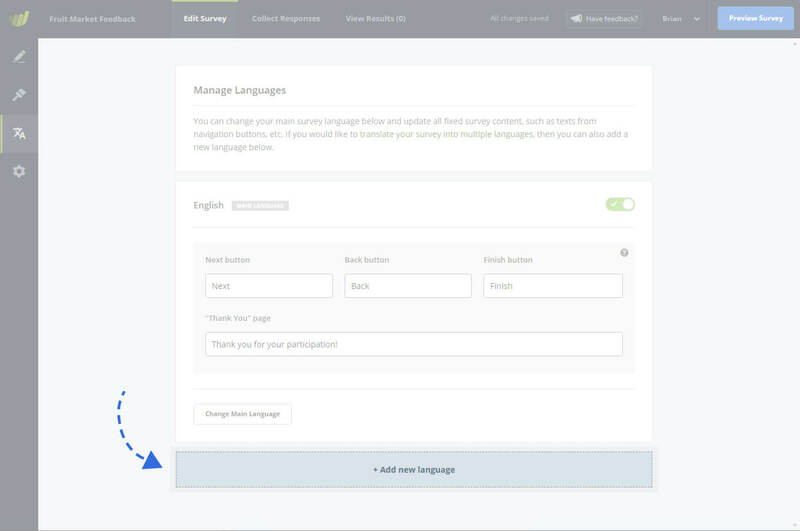 Let participant choose language at beginning of survey When this option is selected, it will show a language selection page at the very beginning of your survey. This will allow the participant to choose which language they would like to view the survey in from the languages you have set up. 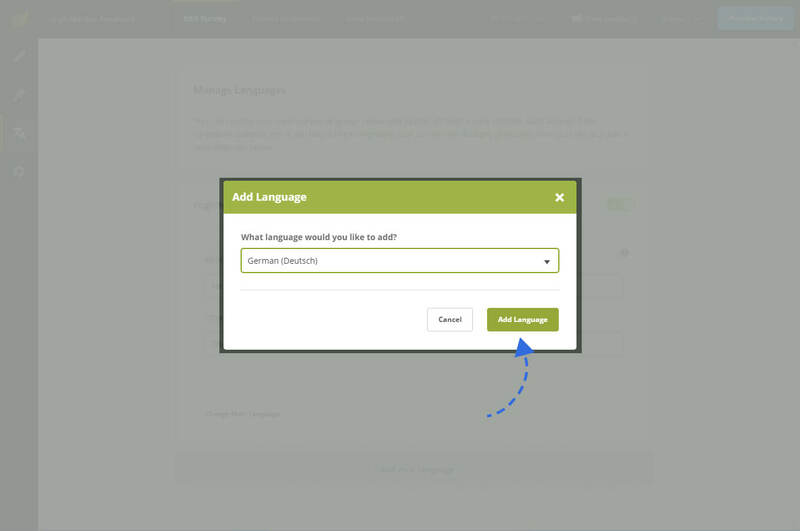 Only show survey in following language: This option can be used to only show the participant a particular language. This should be used when you would rather send groups of participants a separate link based on their language. It also eliminates the need for the language selection at the start. 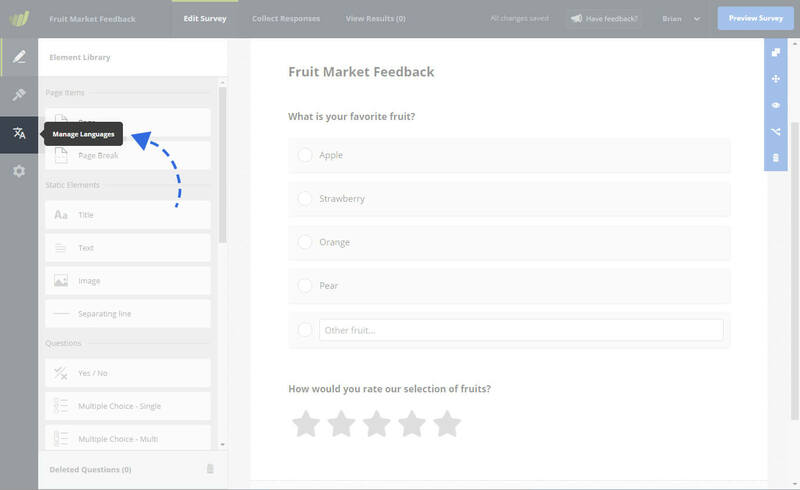 The language selection will always be shown at the start when you preview your survey directly in the tool. In the live survey, however, you will need to activate this option from the collector settings. No matter what language your participant chooses, your survey responses will come in just the same as they normally would. You will find a “Language” filter in both the Individual Responses and the Report area. This will allow you to filter the responses based on language and any filters you set will also be applied when you export your data to PDF or Excel/CSV format.